Greener Gardens: Sustainable Garden Practice will start this Thursday evening, June 29 and runs through August 24. This class is one of the elective classes for the Gardening and Horticulture Certificate Program and the Sustainability Certificate Program. David I have taught this course for several years at this point. We are ever astounded at the quality of our students and their willingness to approach a different way of looking at our everyday life and how our gardens are a point of impact on the world. Every action we take in our lives aligns our lifestyle with sustainability or lack thereof. What can we change as individuals to live a less impactful life and in what way do we compromise? How can we, in this year of abundant rainfall make changes and improve our immediate surroundings – and what should we look for in governmental policy to make sufficient changes in the Nation’s approach to global warming. This is not a year to relax − we see our work is ever more important and urgent in the face of mass denial. This is not the definitive course on being sustainable, but it does impact the way we act in our immediate environment and with our food. Students have told us this course features more than just a few “Aha” moments! Meeting in 321 Botany Building on UCLA Campus this quarter. Now that we are at the end of our historic drought, many folks are thinking “business as usual,” but from our perspective as instructors, this is the very best time to look at some of the issues that we can change without feeling like we are under the gun to HAVE to change. 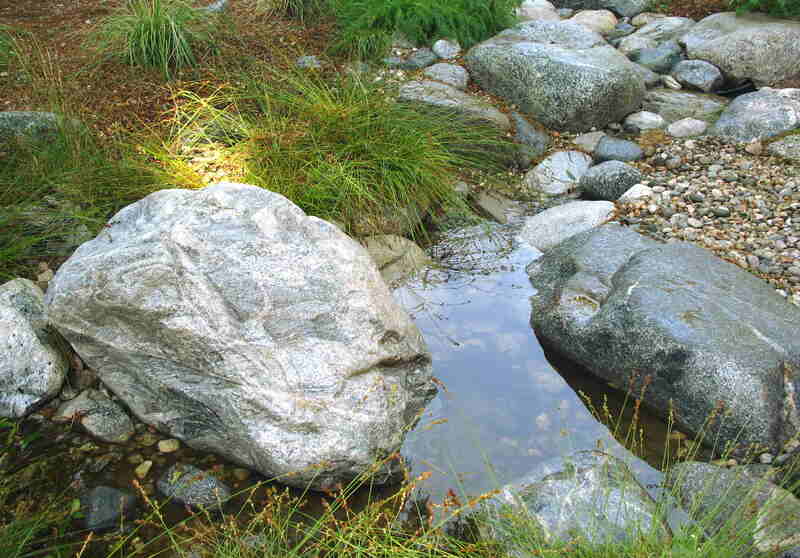 I am reprising my water talk for Sierra Madre on Friday, April 24 at 7:00 pm at City Hall. The next morning, April 25 at 9:30 am, we will be digging some swales at a Sierra Madre residence. The demonstration will only make sense in the light of the talk the night before, so please come to both! We can do better. This program will show simple ways to detain water on site and infiltrate it back in to the aquifer. Orchid will show examples of swales, earthworks, cisterns and other rainwater harvesting methods that can be used to store water on site, creating a better environment for plants to grow and helping to re-fill our aquifer and our wells. 232 W. Sierra Madre Blvd. 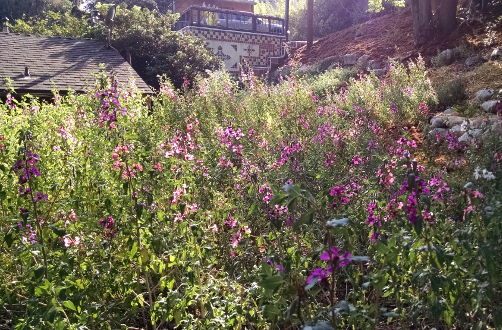 Jennifer LaPlante and Steve D’Auria’s Sierra Madre garden will be on the Theodore Payne Garden Tour for the 4th year this Saturday! The Tour runs from from 10 a.m. to 4 p.m. The Theodore Payne Garden Tour features 47 gardens across the Los Angeles area during two days, Saturday the 21st and Sunday the 22nd. This garden is number 7. At this point, the garden is more than 8,000 square feet of local native plants and hosts goldfinches, woodpeckers, scrub jays, squirrels, deer, bears and bobcats! It features a wildflower meadow ringed by coast live oaks. Restoration of the local ecology was an important purpose in creating the garden. It features local native plants and 90% are species local to the area. Many are rare. It features plants such as the Humbolt Lily, Lilium humboldtii, Dudleya lanceolata and D. cymosa, the local Coral Bells, Heuchera caespitosa, and the Soaproot, Chlorogalum pomeridianum. Several beautiful fountains by Stonemason Bruce Goss evoke the many streams, rivers and seeps of the San Gabriel Mountains. See his Flickr Gallery, and find more photos on Facebook. To see beautiful photos of the work in progress by artist/photographer A. Fanto, go to http://afanto.com/ansg/. I will be giving a presentation on Getting Started with Native Plants during the City of Monrovia’s Monrovia Area Partnership 5th Neighborhood Conference. The Conference is free. It features 24 speakers on many topics, including Solving Stormwater Runoff, Immigration Outlook, Therapy Dogs and the Wild Side of Monrovia. Childcare provided for ages 6-16. Classes will be also given in Español. For more information, look on the Orange County CNPS website. 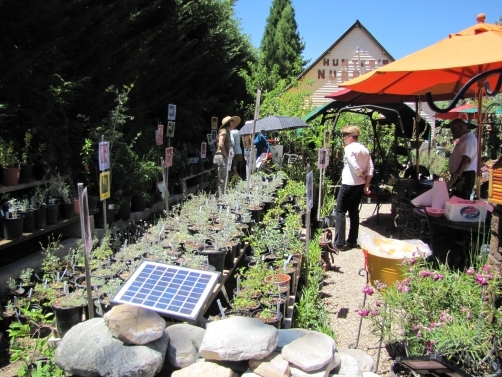 The 10th Annual Xeriscape Garden Tour will be held on Saturday, July 14th at Eminger’s Mountain Nursery across from Denny’s. This free tour will feature 6 homes here in Big Bear Valley that offer solutions and alternatives to planting big grass lawns. Have a small yard and need ideas? 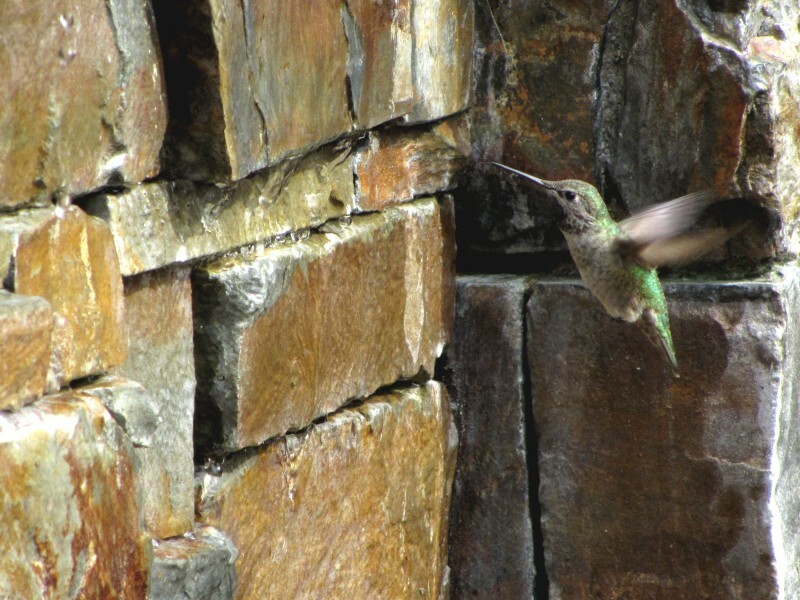 The Xeriscape Garden Tour is for you. This year we have added a fun new feature for kids and the young at heart—a scavenger hunt at each home. There will be a photo of a piece of yard art for each home. As you are wandering around the yard see if you can spot the hidden gnome or wind chime. Sign up for the tour anytime between 9 am and noon at Eminger’s where you will receive a tour booklet and map for this self-guided tour. There will be information on hand at the start location as well. You’ll have until 4:00 pm to see all the gardens. I’ll be at Hunter’s Nursery (FB) as usual, providing information about the many wonderful native plants for sale at Hunters that day. This is your chance to buy rare and beautiful high-altitude native plants. Many are hard to find even at native plant sales. Lemon Lily, Lilium parryi, Rose Sage, Salvia pachyphylla, Rabbit-Ear Penstemon, Penstemon labrosus, and Parish’s Catchfly, Silene parishii are all available at the Hunter’s, with other rare native and drought-tolerant plants that will grow above 7,000 feet. Find a full plant list for this year on my Resources page. The tour is created by the Sierra Club Big Bear Group, and co-sponsored by the Big Bear DWP. For more information, please call Christie Walker at (909) 866-5006. People have been checking on my blog to find out about this year’s Big Bear Xeriscape Tour, so I thought I’d help them out by posting this year’s date, July 14, 2012. There are 8 featured homes on the free self-guided tour, plus two nurseries, Eminger’s and Hunter’s. I’ll be at Hunter’s Nursery (FB) as usual, providing information about the many native plants for sale at Hunters that day. 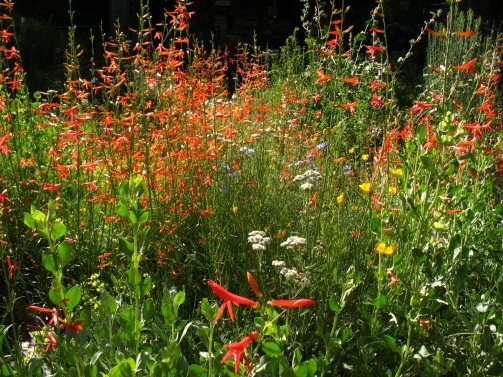 This is an opportunity to get your hands on some very rare high-altitude native plants. 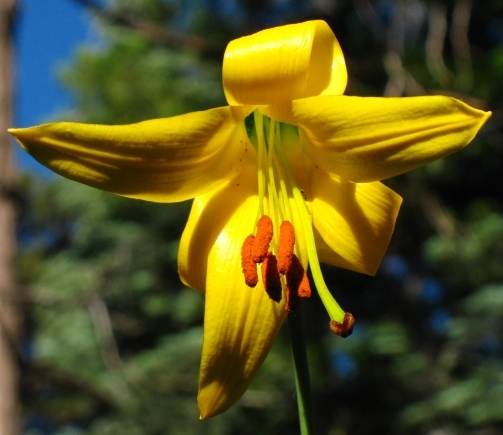 Last year Lemon Lily, Lilium parryi, Humboldt Lily, Lilium humboldtii, and Rose Sage, Salvia pachyphylla were all available at the Hunter’s, plus a wonderful assortment of drought-tolerant plants that will grow above 7,000 feet. The tour is created by the Sierra Club Big Bear Group, and co-sponsored by the Big Bear DWP. I’ll post more information nearer the date. For more information, please call Christie Walker at (909) 866-5006.